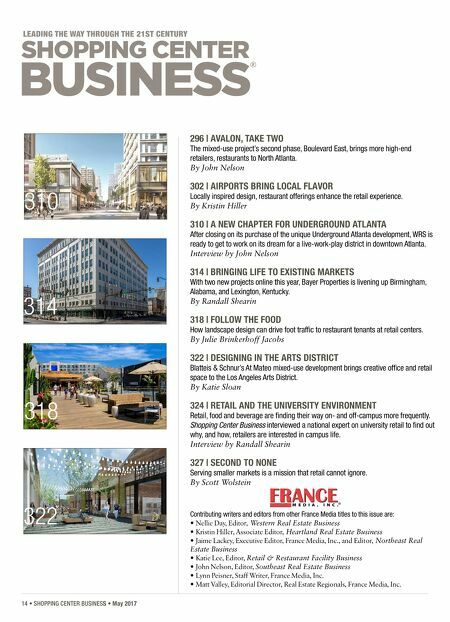 14 • SHOPPING CENTER BUSINESS • May 2017 ® 322 296 | AVALON, TAKE TWO The mixed-use project's second phase, Boulevard East, brings more high-end retailers, restaurants to North Atlanta. By John Nelson 302 | AIRPORTS BRING LOCAL FLAVOR Locally inspired design, restaurant offerings enhance the retail experience. By Kristin Hiller 310 | A NEW CHAPTER FOR UNDERGROUND ATLANTA After closing on its purchase of the unique Underground Atlanta development, WRS is ready to get to work on its dream for a live-work-play district in downtown Atlanta. 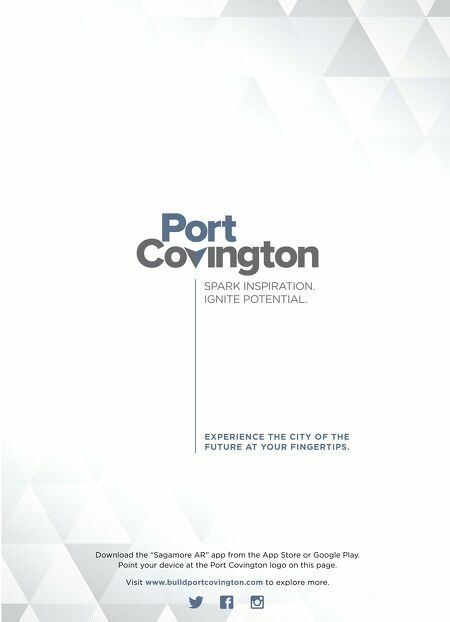 Interview by John Nelson 314 | BRINGING LIFE TO EXISTING MARKETS With two new projects online this year, Bayer Properties is livening up Birmingham, Alabama, and Lexington, Kentucky. By Randall Shearin 318 | FOLLOW THE FOOD How landscape design can drive foot traffic to restaurant tenants at retail centers. By Julie Brinkerhoff Jacobs 322 | DESIGNING IN THE ARTS DISTRICT Blatteis & Schnur's At Mateo mixed-use development brings creative office and retail space to the Los Angeles Arts District. By Katie Sloan 324 | RETAIL AND THE UNIVERSITY ENVIRONMENT Retail, food and beverage are finding their way on- and off-campus more frequently. Shopping Center Business interviewed a national expert on university retail to find out why, and how, retailers are interested in campus life. Interview by Randall Shearin 327 | SECOND TO NONE Serving smaller markets is a mission that retail cannot ignore. By Scott Wolstein 318 314 310 Contributing writers and editors from other France Media titles to this issue are: • Nellie Day, Editor, Western Real Estate Business • Kristin Hiller, Associate Editor, Heartland Real Estate Business • Jaime Lackey, Executive Editor, France Media, Inc., and Editor, Northeast Real Estate Business • Katie Lee, Editor, Retail & Restaurant Facility Business • John Nelson, Editor, Southeast Real Estate Business • Lynn Peisner, Staff Writer, France Media, Inc. • Matt Valley, Editorial Director, Real Estate Regionals, France Media, Inc.